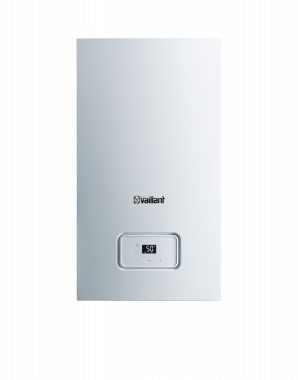 The Home 18kW System Boiler is a highly reliable boiler that’s been designed and manufactured by Vaillant with efficiency in mind. The efficiency of this unit is shown by its ErP rating of A, given to it because it’s 93% efficient, it also has a SAP efficiency of 89.3%. It has an output rating of 18kW, making it perfectly suited for the smaller homes that don’t have such a high demand for heating and hot water. Also available in outputs of 12kW, 15kW and 25kW there’s a boiler in this range that can meet the heating and hot water demands of small and medium-sized homes. You’ll be saving valuable space around the home with this unit thanks to its compact size that measures at dimensions of 740x418x300mm (HxWxD). In addition to this, it’s a wall mounted boiler which means you’re saving floor space too. Fitted with an easy to use interface and a wide range of controls, this unit helps to give you maximum control over your heating. It also features a modulation of up to 1:5, increased efficiency, fully modulating low NOx burners and a no fill condense tap for simplicity on commissioning. As a System boiler, it sends hot water to the radiators and a sealed hot water storage cylinder. The important parts of the system are built into the boiler which makes it more compact than a Regular boiler and easier to service. You’ll also be getting a 2 year warranty with the Home 18kW System Gas Boiler to help give you peace of mind long after installation.